This was the most fun combination of all the reasons I went on this trip. We had a wide array of really interesting scenery. The ride itself was very challenging, but not “killer”. We had a number of long difficult climbs that were immediately rewarded with exhilarating sweeping, winding descents. 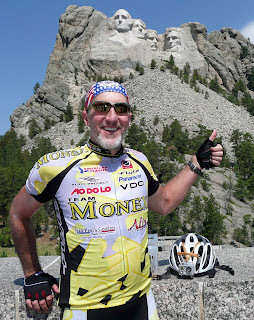 The best 10 mile stretch of climbs was rewarded with the fabulous Mount Rushmore. After riding the bicycle I now understand the “Rush” in Rushmore. The ride was quite a rush. I could not have scripted nicer weather. Cool, 67 degree start. By the time we finished temperatures in the low 80’s. An early evening thunderstorm with hail rolled in but we were all fed and tucked safely into our hotel room by then. Five people had to sag or get hauled in on the van today. The ride was tough. It was almost 6,000 feet of climbing. Darrel Fort unexpectedly announced he was giving up the ride due to a knee that would not stop bothering him. We’ll miss him. He was our oldest participant at age 69. Darrel really wanted to do it and I know he didn’t quit easily. So we’ve permanently lost two so far. It’s a little like survivor at this point. We occasionally talk quietly about hoping we don’t get sick or hurt so that we can actually finish this adventure. Click on above for a slide show of the day through my helment cam! The endorphins kicked in early and stayed high in my system all day. It was sensory overload. I felt good all over. My pelvic floor is now leather like and doesn’t seem to mind the long hours in the saddle. The rest of me was well fed, rested and ready to ride today. I had the pleasure of riding the entire day with Gerard. We had one of those fun days where we both felt pretty good, started after everyone had left and ended up being the first to arrive. We really did sight see as well. One of the fascinating things that really came home to roost today about this adventure is the heightened sensory perception you have when you experience some new geographic area by bicycle. You see more things, hear, smell, taste and absorb so much more of the countryside when you go through it by bicycle. No one today will ever forget the quiet exit in the early morning along the charming river in Hot Springs that is fed by the 170 hot springs in the city. As we quietly climbed out of town up long winding hills these magnificent new vistas of the lush Western prairies opened up to us. I knew nothing about Wind Cave National Park, but now I will never forget the miles and miles of prairie stretching out beyond your imagination filled with Buffalo and prairie dogs. I don’t think most people who drive really absorb the sounds that the prairie dogs and Buffalo make. 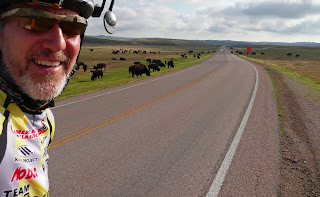 But, now that I’ve done it on my bicycle I not only heard them in the very still of the early morning, but I will never forget the chirping of the prairie dogs and the gruntings of Buffalo. 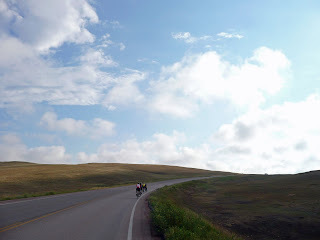 When we left the quiet roads of Wind Cave we entered the black hills of South Dakota. They call them black hills because they look kind of black from a distance and all the other hills are light brown or dirt colored. The dark green pine trees on the hills are what really give the illusion of the hills being black. Anyway we had many winding, twisting turns up and down great climbs that made the bike riding really enjoyable. This is one day I could repeat over and over again. Hey pops; I have your Mt Rushmore picture on my desktop. Missed seeing you in OHio!! love you!! I am reading your blog faithfully but naving a hard time getting my comments to you. I even joined a blog but still not luck. One of these days I will figure out how to tell you how much I am enjoying your trip vicariously.